The PKI 7375 is the worldwide leading, mobile system for fast, reliable and sophisticated X-Ray, Metal- and Trace-detection screening. 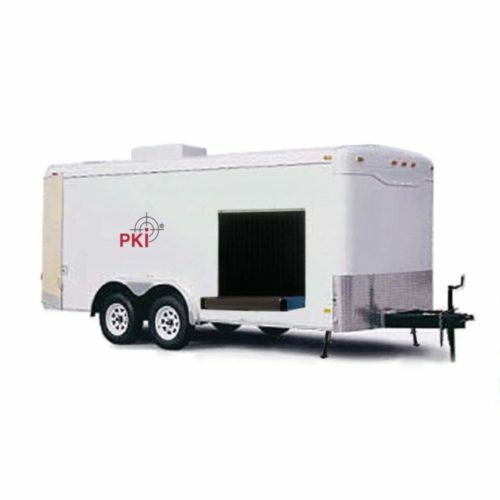 It is a self-contained and trailer- mounted device providing a mobile security system to be used by any government department, in sea- and airports, at border crossings, warehouses and correctional facilities to meet every requirement to screen cargo, packages and luggage. Many government departments of ransportation have already approved this tandem axle trailer as being the best solution for all these purposes. Free from noise and distraction, the operators can concentrate on such inspections, as the PKI 7375 is equipped with a double-walled insulation of 50 mm and a super-silent roof-mounted air-condition system. Precise X-Ray images of renowned clarity are generated by the integrated X-Ray detector system and superbly displayed on flat screen monitors. The well-appointed station console is ergonomically adjustable and provides a complete array of image identification and processing feature. For each and every operation, equipment quality and placement are determined for longevity and reliability. everal software programmes are already installed on the Pentium 4 computer. X-Ray detectors: surface-mounted, multilayer, fully integrated, high frequency, solid state, detectors using high speed processors and advanced Pentium 4 signal processing with multi-energy.